CSC Motorcycles completes 5000-mile RX3 tour of western US with riders from China, Colombia, and the US. 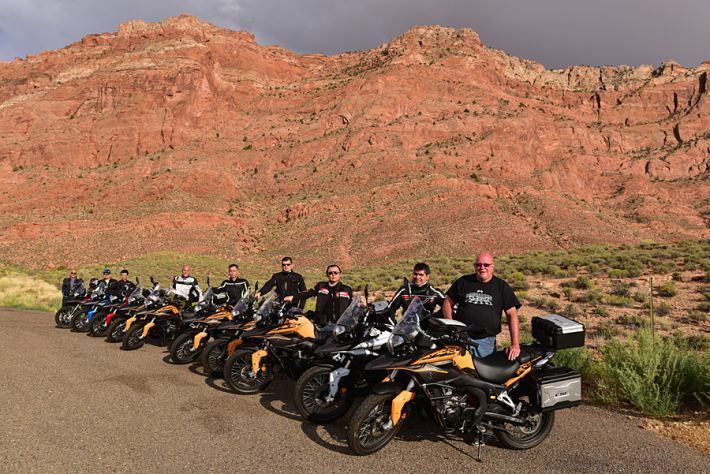 AZUSA, Calif. - Aug. 4, 2015 - PRLog -- CSC Motorcycles concluded its Western America Adventure Ride on Saturday, 1 August 2015, after covering 5000 miles through 9 states with riders of its flagship adventure touring motorcycle, the 250cc RX3. During this ride, motorcyclists from China, Colombia, and the United States visited Joshua Tree National Park, Zion National Park, Bryce National Park, Capitol Reef National Park, Mt. Rushmore National Park, Yellowstone National Park, Devil’s Tower National Park, Hell’s Canyon National Park, Redwoods State Park, Custer State Park, and several other US and state parks. The team crossed the Colorado River, the Snake River, the Russian River, the Columbia River, and several lesser tributaries. The Western America Adventure Ride started at CSC Motorcycles Corporate Headquarters in Azusa, California, and continued through Arizona, Utah, Colorado, Wyoming, South Dakota, Idaho, Oregon, and Washington in temperatures ranging from 105 F to as low as 35 F.
The Western America Adventure Ride included motorcycle journalist/riders from China, Colombia, and the United States. The RX3 is a 250cc, single-cylinder adventure motorcycle. The RX3’s $3495 MSRP includes luggage, engine guards, a windshield, a skid plate, electric starting, engine counterbalancing, front and rear disk brakes, and liquid cooling. The motorcycle includes a 2-year, unlimited mileage warranty. More information is available from CSC Motorcycles at 909 445 0900 or info@cscmotorcycles.com.